The city of Baytown is a postwar amalgamation of three smaller communities. 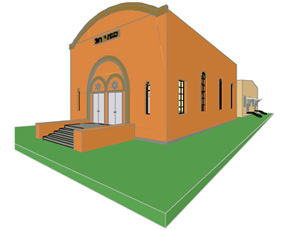 The synagogue was completed in 1930 in what was then known as Goose Creek. It was designed by the Houston Jewish architect, Lennard Gabert who later completed several notable synagogue projects in the region. The social hall beyond was originally a small school building relocated to this site. Later, the building was enlarged to its present size and configuration. Although the cutaway view shows the gracefully curved ceiling, it does not show the lovely stained glass windows of the main building. A small foyer with flanking utility and restrooms adjoins the main sanctuary, which has never had a separate women's balcony. 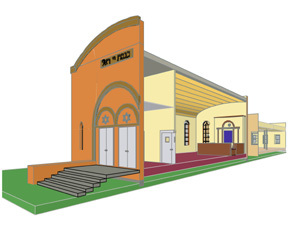 The bimah has been restored to the side stair configuration shown; the existing stairs are now on axis with the ark.